Here’s a little secret: we don’t always agree with each other, and that’s okay. When we decided to start our collaboration, we knew that we wouldn’t agree 100%. There have been polls and questions and countless discussions along the way, but we could agree on something. The views expressed in any on particular post are those of the author. We might not agree, but we respect each others’ views and words. And we hope you do, too. Still want to drop us a line? 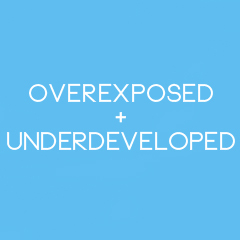 You can email us at: overexposed.and.underdeveloped@gmail.com.